Using a minimal palette of black, white , and gray, punctuated by the occasional primary color, Susan Grossman’s drawings recall classic film noir. She finds compelling subjects and locations by crisscrossing the city and taking numerous photographs. Once in the studio, Grossman, like William Kentridge, begins to draw and then obsessively shifts her narrative world away from her sources. She re-positions buildings and vehicles while adding and subtracting characters to achieve the final cut. The physicality of her process is crucial to achieve the “just happened”feel of her work. Susan Grossman graduated from Bennington College and received he MFA from Brooklyn College. 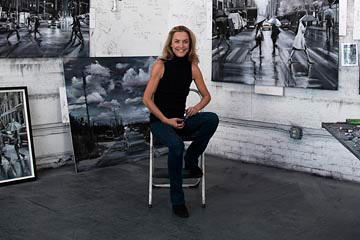 Ms Grossman has taught at Wesleyan University, the City College of New York, and the National Academy of Design School, and mantains a studio in Brooklyn. Her work can be found in numerous private and public collections throughout the United States, including the Mint Mueseum in North Carolina, the New York Historical Society, and numerous one-person exhibitions in New York City and around the United States.